This lovely figure is from15mm.co.uk's SMH range, and was sculpted by the very talented Eli, of I see Lead people blog and Loud Ninja! I ordered the whole set recently and chose this guy to paint first. The figures gave me an instant feeling of crime ridden alien underworld types, so I did the over-boss of the undercity first. 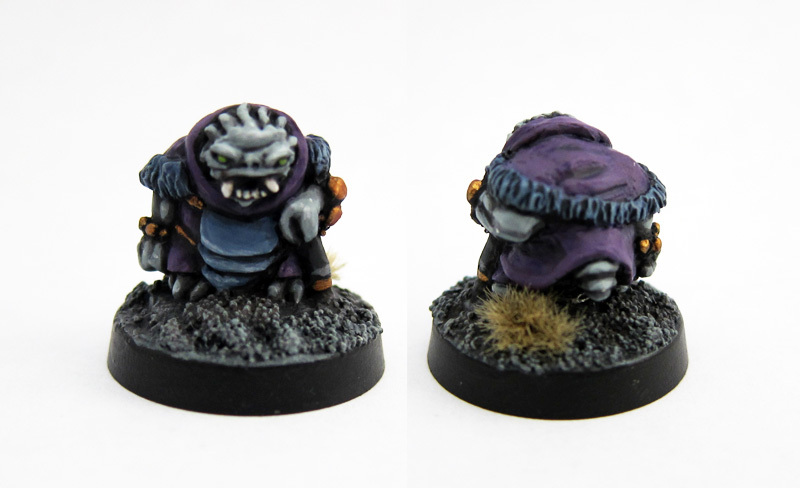 He's short but very wide (yes, that's a 20mm base) and was a pleasure to paint. 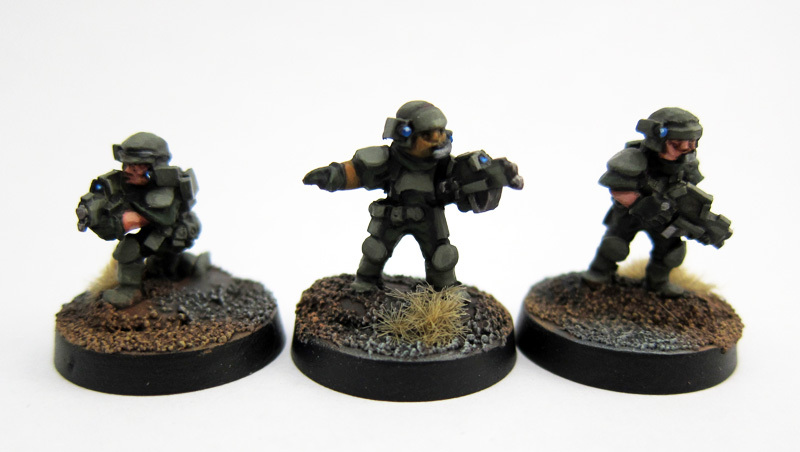 Also done recently, some Khurasan Exterminators. I did 2 of these in a desert-ish scheme and was really unhappy with them, but a good ol' US olive drab scheme suited them much better and these got done relatively quickly. 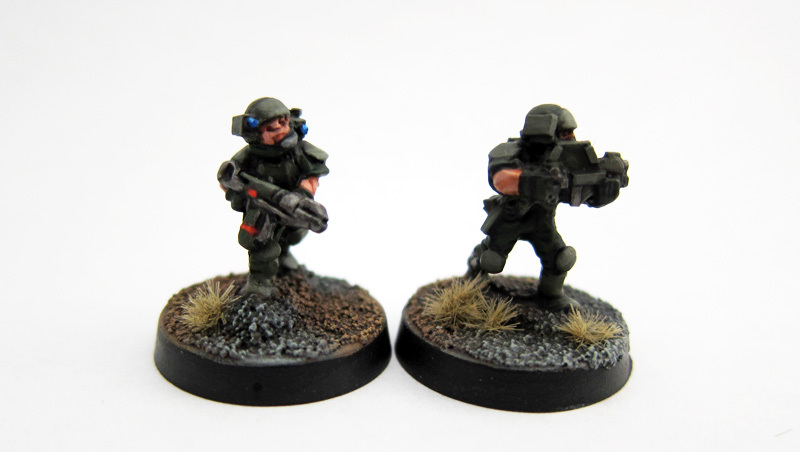 Doing a dark green fatigues with lighter green armor and gun wasn't the smartest thing I've ever done, but I think they came out OK.
Great job, Jacker! It all looks good! I am waiting on my order of this guy and a bunch of other aliens. Keep a wet edge! Thanks Jay! You won't be disappointed, They sit very well with the old Laserburn figures in terms of style but bring a whole bunch of character that you don't see often these days. Part of this is due to the fact that Star Wars and other 1970s/80s scifi are a huge influence on my designs. 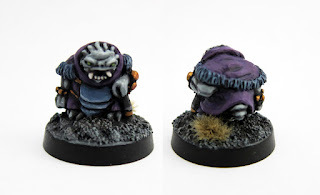 I think these same influences worked their way into the Laserburn minis. Have you ordered the Khurasan Exterminators Support troops? They came out rather recently. I ordered the hard suit guys and am expecting them soon, but I think I forgot the support troops. Maybe when I finish this squad. You refer to the base as "yes it is 20mm" or words of that kind. What is the normal base size that you use for alle your 15 mil stuff ? I am asking since I am contemplating individual basing for 15 mil figures in a project I am thinking about. So cracking work there, I've recently started following Loud Ninja games, and am quite interested in how their Chuhuac turn out. Can never have to many random alien types. I agree, there are plenty of human troops out there already! Crisis in Alcovia is undergoing a scale change. 20mm just wasn't working for me. 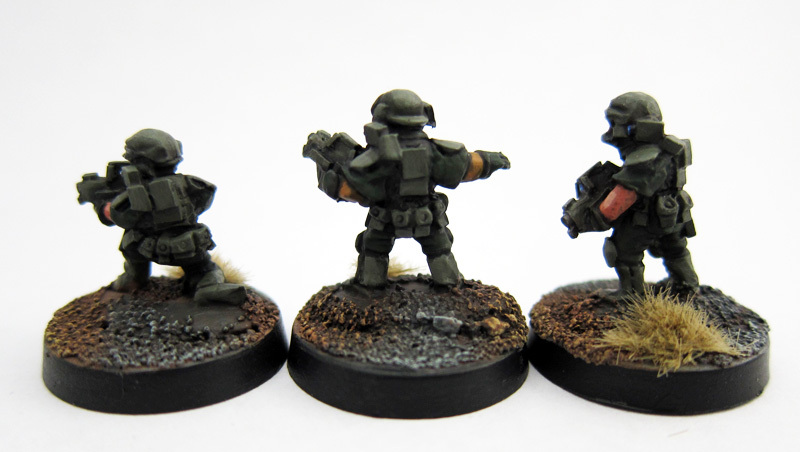 While there were infantry a plenty, I wasn't digging doing new scenery for just one project. Vehicles also ended up being pricey unless I wanted to assemble a bunch of fiddly plastic models. The credit goes to Eli, but thanks Ferret! Crime boss is very very nice! It's not even thors-day! Thanks Mik, likewise buddy. See, there is a God- I've actually bought these Exterminators before you painted them and sent me scurrying for the Paypal password-oh yes, by the way, the painting is excellent.............as usual. Thanks Gunrunner, they are quite reqwarding minis to paint once you get into them. The weapon detail is amazing for 15mm. Cracking work as always Space Jacker. Personally I reckon your choice of green's works really well on those Exterminators. Cheers Legion, they do look a little better IRL.. I think my experiment with white background photography didn't help the photos. That crime boss is especially cool and those Exterminators are excellent. Thanks for the praise on the Crime Boss. Words like these really inspire me to keep pushing out the alien personalities. I have to be honest that I had hit a serious sculpting slump after I finished that batch, but their reception has been invigorating. Jacker's paint job makes him look great. Yeah the crime boss is cool, and the exterminators are looking good to, I think the lighter armour over dark fatigues is OK, I will try Colonial cammo on mine, I'm not to sure if 2 types of cammo on the 1 15mm figure will work very well though. I'm thinking it may just look messy. I haven't liked any of the double-camo attempts I've seen around.. IMHO camo rarely looks very good on a 15mm figure unless it's quite regular.. And even then the figure often becomes a blob. 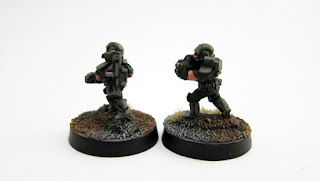 I think if you kept the camo pattern to either the armor or the fatigues it would work well on these particular minis. Camo is trouble on any figure, and I think it's because it WORKS. I mean, we need to enhance and pick out details and shapes, but the whole purpose of camo is to hide details and distort outlines. If you paint camo on a figure properly... it should by definition make it less eye-catching, no?